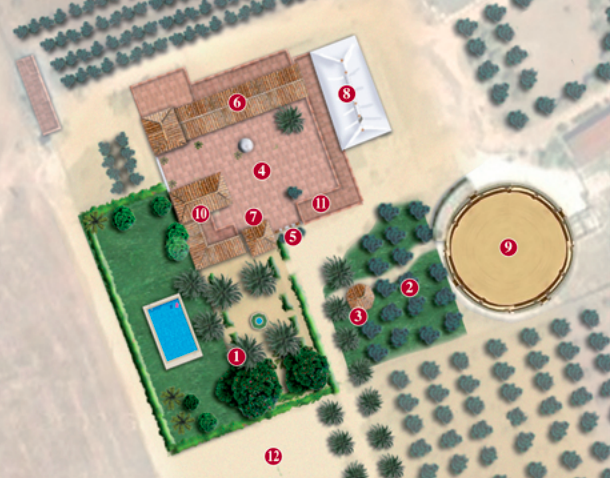 Situated in traditional Andalusian countryside just a few minutes from the city of Seville, the Hacienda La Moharra is an ideal setting for exhibitions and celebrations. Its welcoming atmosphere, attentive service and first rate facilities guarantee the success of any event or celebration. Clicking on the map you can see the situation of all our facilities. Some of them are described below. The charming the De La Madrina Gardens are landscaped with ochre albero soil brought from the nearby area of Los Alcores and rosebushes which add a striking touch of colour to the atmosphere. The gardens are planted with a variety of ancient palm trees, araucarias, sago palms, as well as brightly coloured flowers arranged around a beautiful fountain decorated with typical Sevillian-style ceramic tiles. There is also a summerhouse next to a recreational area which opens during the summer and is ideal for enjoying an aperitif or cocktail service. rosemary, thyme, lavender, and aromatic plants we reach the bullfighting arena. This large, air conditioned salón occupies the former oil mill, stables and storing facilities of the old farm. 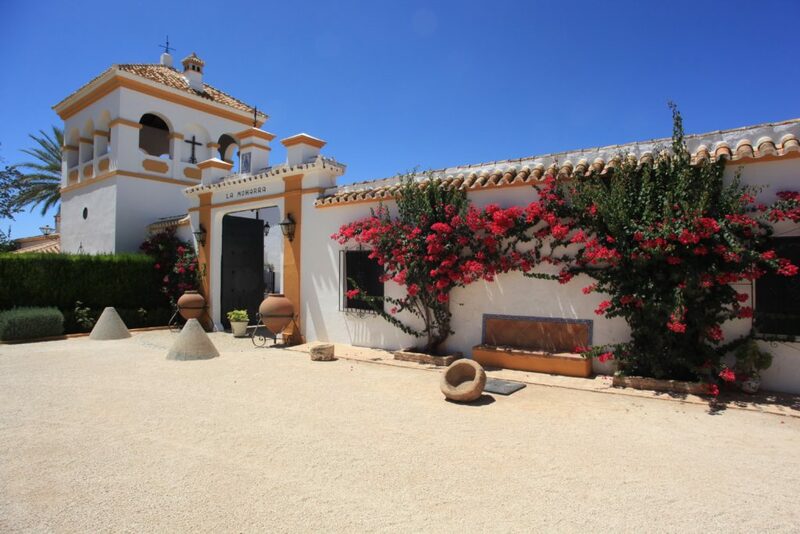 It has been exquisitely converted into an elegant room decorated with paintings and traditional Andalusian farming implements, this salon is ideal for hosting banquets with an excellent range of local products, exclusive presentation, and attentive service. This whitewashed courtyard boasts the distinctive architectural features of traditional Andalusian haciendas set in olive plantations: a tower, an entrance gateway, and the indispensable central well. Landscaped in the typical Sevillian fashion with bougainvilleas, jasmine, and a sea of potted carnations and geraniums, this courtyard is a magnificent location for banquettes, cocktails, and a wide range of events. 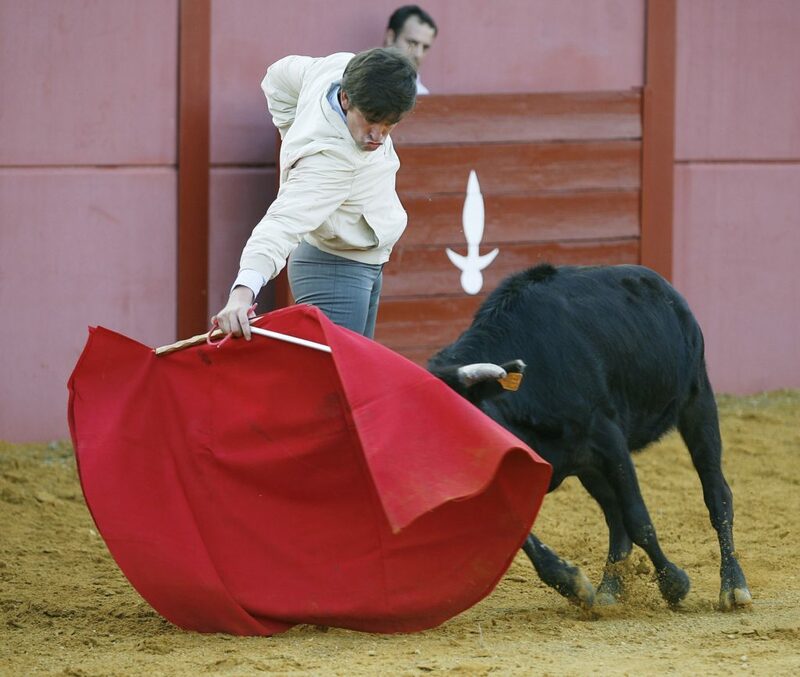 This modern and comfortable bullfighting facility is well lit and features a large arena. With lush gardens and a charming courtyard, water fountains, traditional rooms, vigorous horses for exhibitions or vintage carriage driving, fireworks, full-bodied wines, fine gastronomic delicacies, and attentive service, the Hacienda La Moharra is a uniquely charming place which leaves a deep imprint in every visitor. The facilities in Hacienda La Moharra are specially adapted for people with physical disabilities. They include well-lit spaces for evening events, comfortable and spacious toilets, a spacious car park, and air-conditioning (Salón de Don José). The hacienda also has its own stand-alone electricity generating system and a water purifying facility.